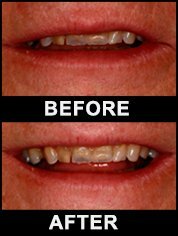 Mrs. P., a pleasant distinguished mature woman presented in our office with previously restored dentition that has served her well for many years but needed to be aesthetically renewed. 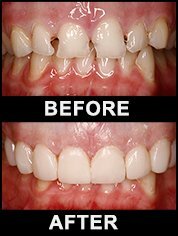 Mrs. P.’s dentition had been restored at different stages of her life and subsequently the shading and shape of her dentition differed. 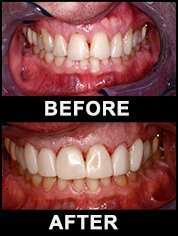 Mrs. P’s desire was to have symmetrical and consistent shading of her teeth. 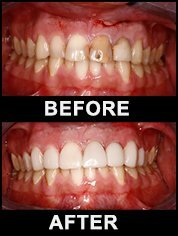 Dr. Moore was successful in restoring Mrs. P’s dentition with porcelain veneers, bridges and crowns and five surface composite resin restorations. Mrs. P has been featured on our info commercial series on CHEX TV. 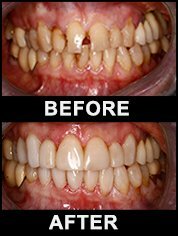 52 year old male. 10 Chairside resins done in one 3 hour sitting. Wand Computerized Anaesthesia: Zero discomfort.